To my knowledge, there are no flags of the Russian Orthodox Church. The only thing we have are banners of varying colors, often a square section at the top, and the rest divided into three tails as long as the square section. Since these are used in church, they are often made of brocade or velvet, and decorated with fringe on all sides, sometimes even the top has a little extra flap of cloth with fringe as well. The three tails are usually rounded, and have tassels at the extremities. The square part at the top has an icon attached to it, usually painted on canvas, sometimes embroidered right onto the banner. The banner is hung from a bar at the top, and the bar is suspended from the top of the pole by a cord from each end of the bar to the center of the pole, or a hook at the center of the bar attached to another hook or eye on the pole. The fabric of the banner can be any color at all, though deep red velvet seems to be a favorite. There is another type of banner (I don't know an English equivalent) made of metal, pierced through to make a design, and with space in the center for an icon. These metal banners are borne aloft by a pole. Either the pole holds the banner up from the bottom center, or sometimes from the side, and the banner is parallel to the pole. In this case, the banner might be just like the cloth banner described above, except for the pole. Since they're metal, they are often smaller than the cloth banners. There was a personal flag used by the Patriarch sometime back. I never got a good look at it. But it was a darkish green color, with, according to one report, the initials P for Patriarch and A for Alexei, or whatever the Patriarch's initial was. It might or might not have had a wreath of laurel leaves. Another report said that it was all green, and embroidered with the face of Christ looking straight ahead, with a wide cross behind the head, and a halo behind that, with, on the cross, the letters, Omicron, Omega, Nu (ΟΩΝ - which translates as He Who Is, or He Who has Being - as in ONtology). This was done in gold. Who knows? This may have been the face and the obverse of the same flag. I've recently come across two photos of the personal flag of the new patriarch, Kyril: http://visualrian.com/storage/PreviewWM/3710/01/371001.jpg [dead link] and a large view at http://www.mospat.ru/archive/44048.htm (direct link to image). 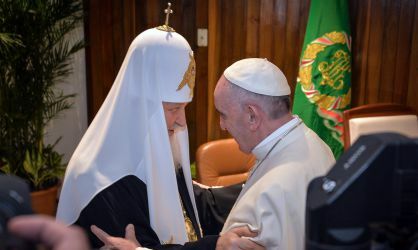 Regarding the Russian patriarch standard there is an image of the standard beside patriarch Kyril and Pope Francis. Source: El País newspaper, online edition, www.elpais.com, downloaded 13/2/2016.